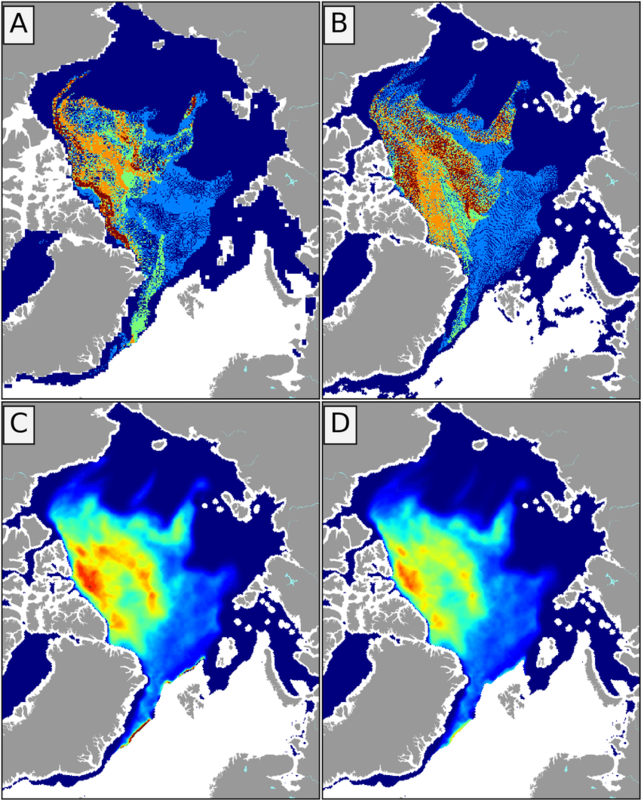 Note the large area of pale blue open ocean still visible in the Chukchi Sea towards the top left of both maps. 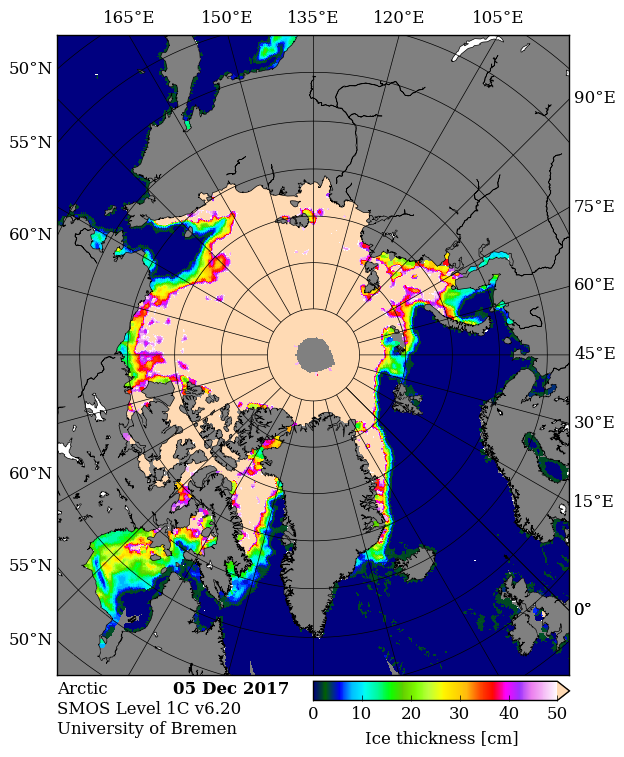 The Chukchi Sea is now mostly covered in sea ice, as is the Kara Sea. Volume is still 3rd lowest behind 2016 and 2012. 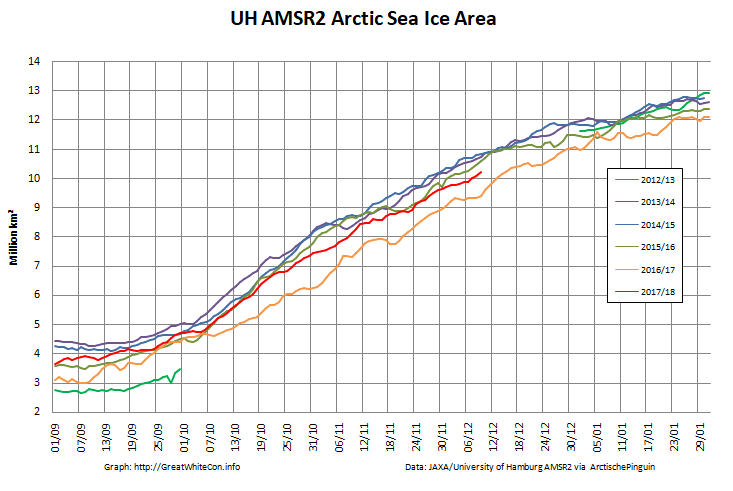 Note that these assorted sea ice age maps are all for January 1st 2016! 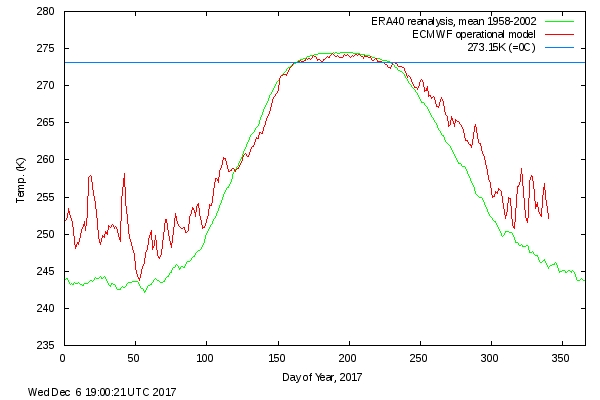 Extent at the end of the month was below average over the Atlantic side of the Arctic, primarily in the Barents and Kara Seas, slightly above average in western Hudson Bay, but far below average in the Chukchi Sea. 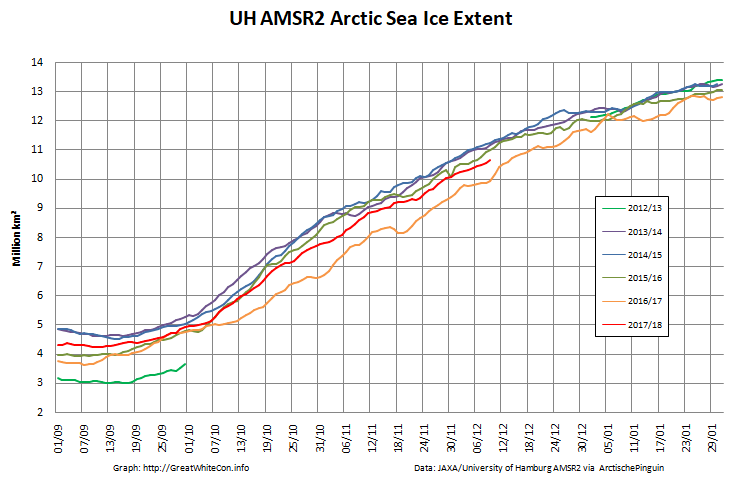 This continues a pattern of below-average extent in this region that has persisted for the last year. 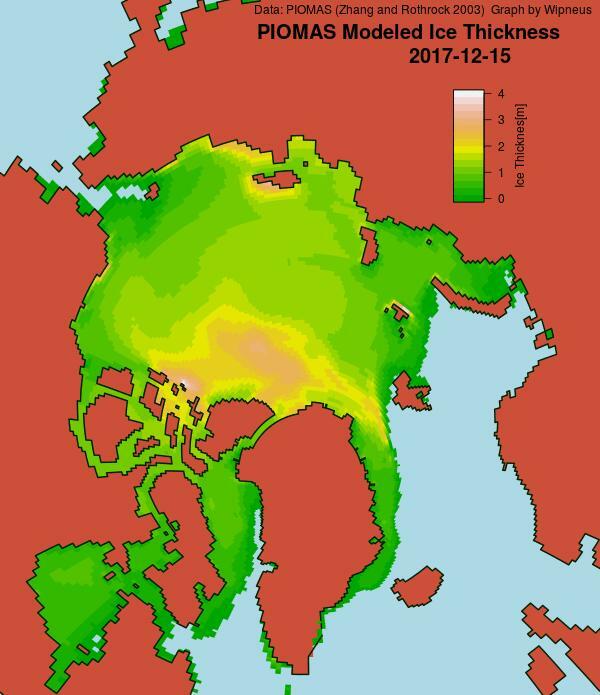 In the summer of 2017, Rebecca Woodgate of the University of Washington, Seattle, sailing on the research vessel Norseman II, recovered mooring data that indicated an early arrival of warm ocean water in the strait, about a month earlier than the average. You mean the Bering Strait? I will, Jim, I will be watching this space! Same bat channel, Same bat time,… *** ka-pow! North of the Bering Strait in fact. PS, do you know what a “Rosby wave train” is? Possibly you found it via the ASIF? 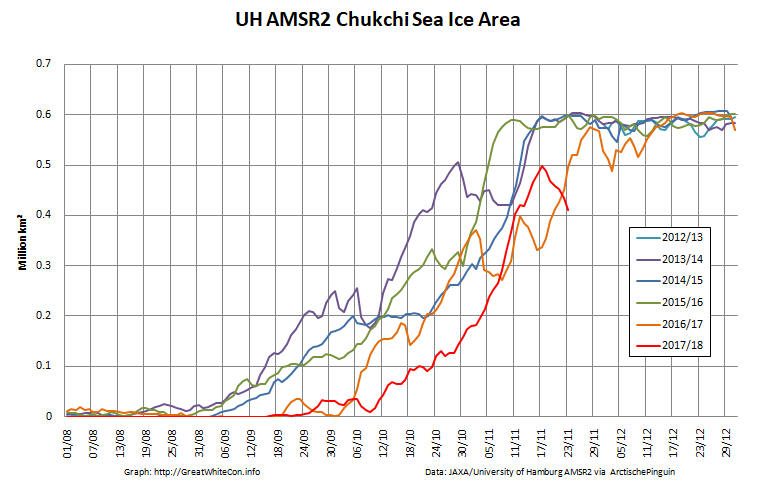 The good thing about the Chukchi Sea is that every year it fills up completely by January. 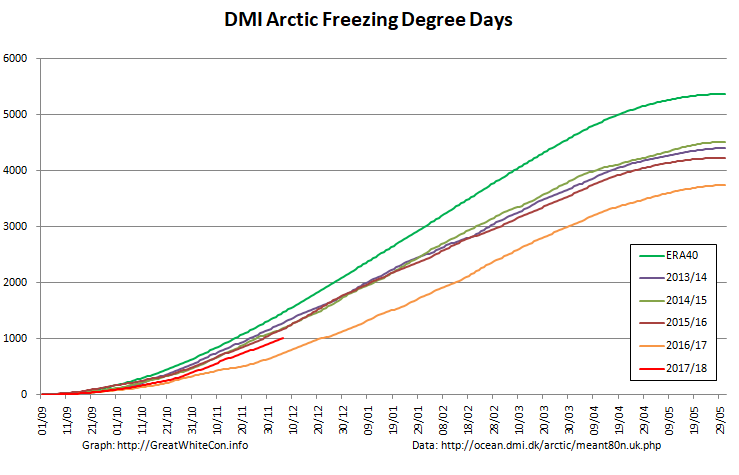 This means that an early melt or late refreeze is in one sense, unimportant, at this stage. 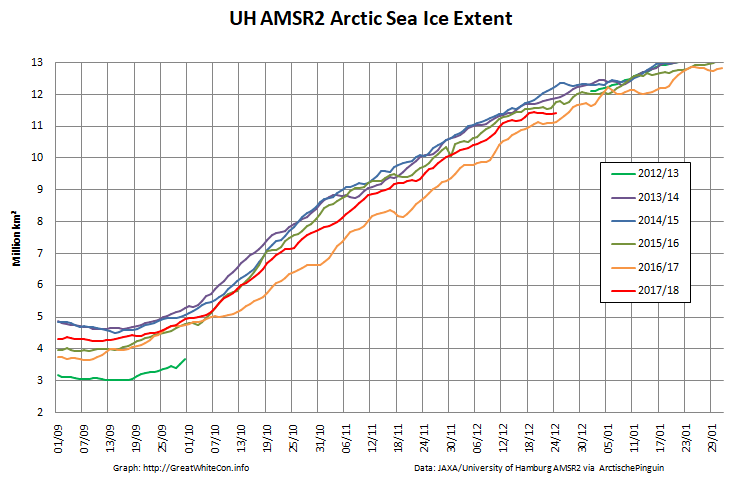 If it was to stay unfrozen in part all year round that might be a cause for concern. 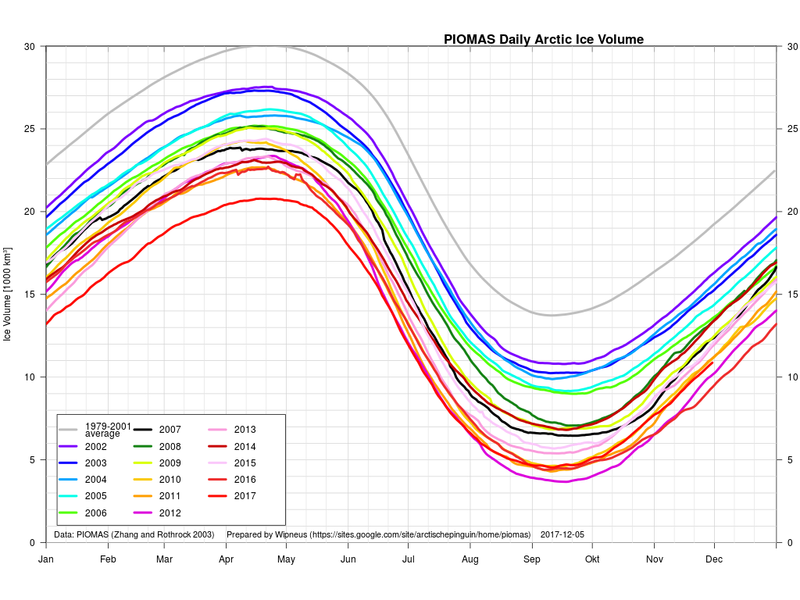 Consequently what one has to watch is the amount of ice forming in the unbounded peripheries. Things like the Sea of Okhotsk and Bering sea and the edges of that long island. Novaya Zemlya. At the moment ice on the eastern side of the latter has been as rare as hens teeth in recent years. Perhaps this year it might be better. 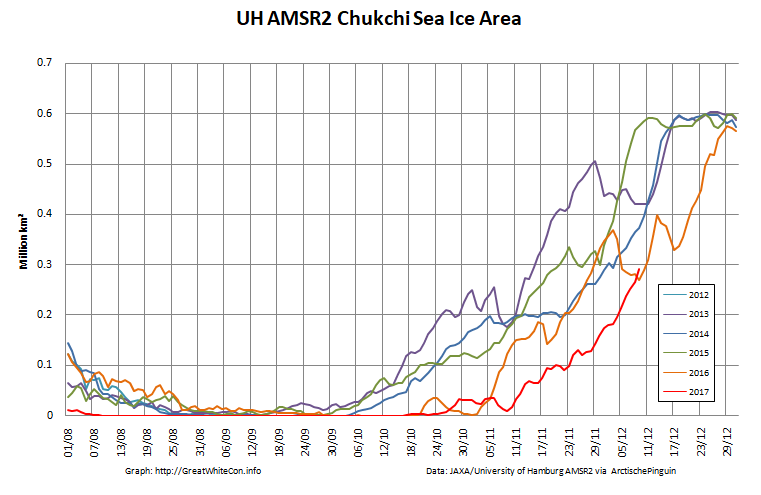 Chukchi is now belatedly freezing up rapidly. 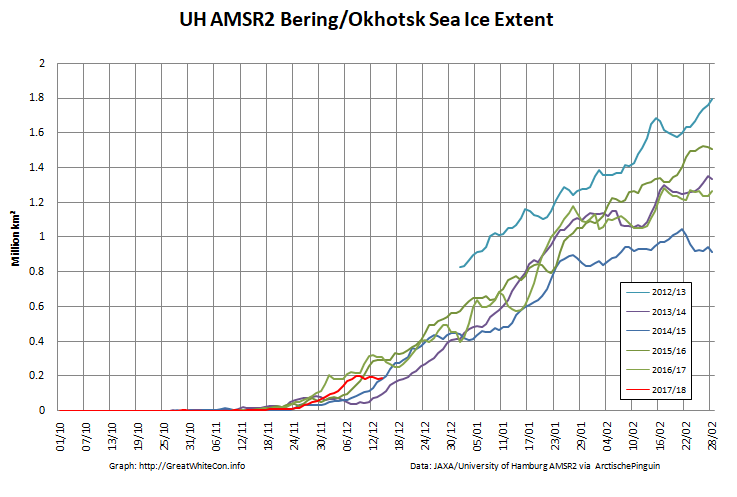 I note that the rapid regrowth in Okhotsk was not deemed worthy of a mention, perhaps a little each way commentary would be good at times, positives as well as negatives? Anyway merry Christmas and keep on blogging. Enjoy the fact that people are prepared to work hard to get these views across. I concur: there appears to be nothing unusual here! Wow, look at how far below 2016 is…. there must be a hangover effect! I suppose this is like so called ‘semi-periodic’ patterns,…. there is still something actually going on here! …or am I falling for Ye olde human frailty of reading too much into graphical information? Interestingly, the main volume in the CAB is drifting “westwards”, which gives hope that the thick ice could be more protected from export this year. 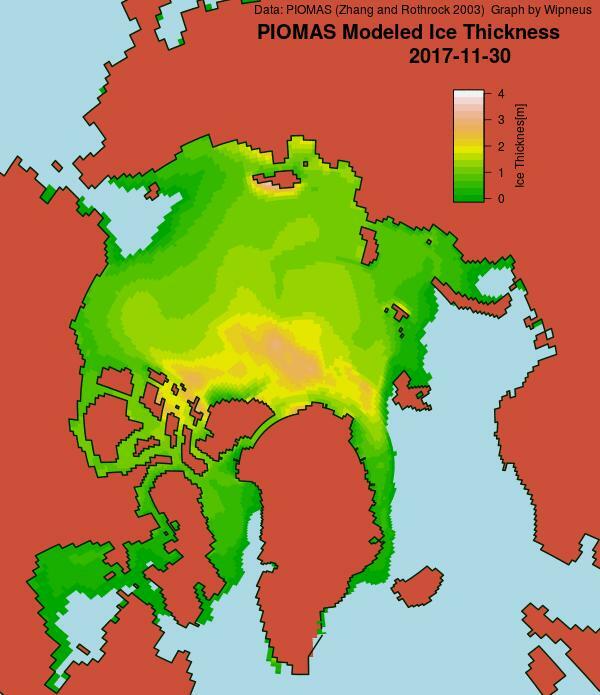 Could this likewise mean the thick ice is being drawn into the Beaufort Gyre, I.e. that The Gyre is active and,… well I don’t know what’s next,… um, then FRAM STRAIT EXPORT? 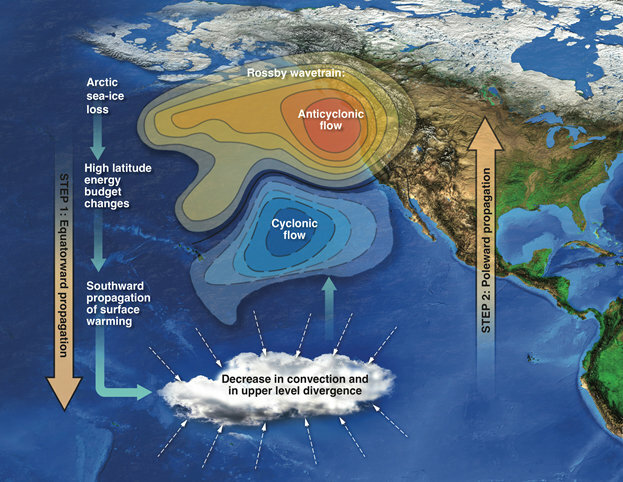 Basically I was thinking that Oren’s comment might also mean activation of the gyre which means mechanical input of energy thus adding to the ultimate melting of the sea ice! There does seem to be a thin sliver of thicker ice rotating around the Beaufort Sea. There also seems to be a much larger lump of thicker ice heading for the Fram Strait exit! Rounding out well and filling up all the basins. 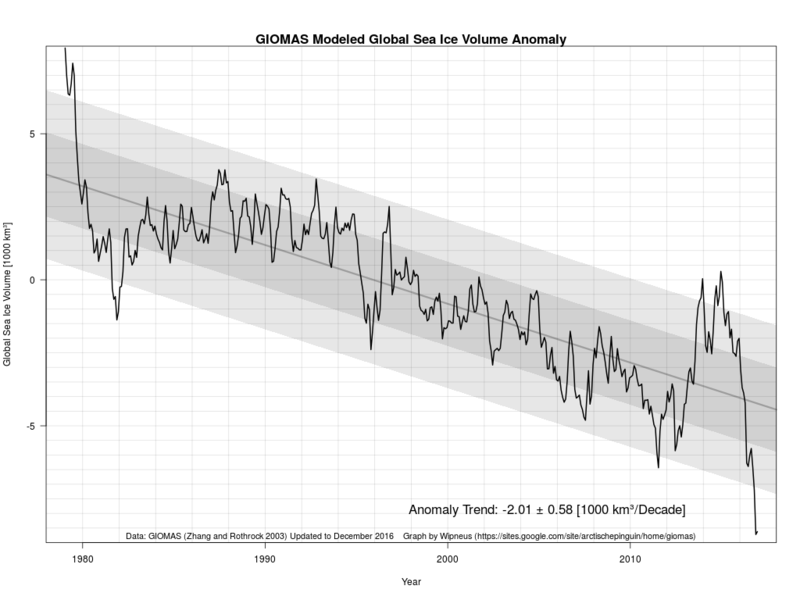 Looks like the outer seas might add to volume this year which is a surprise given how quickly the Pacific melted them last year. 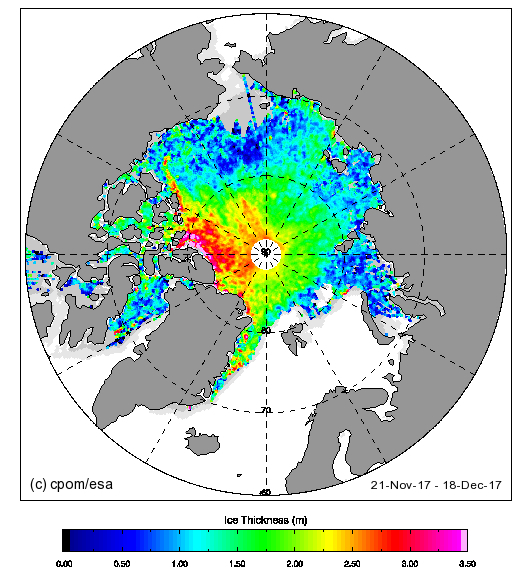 Arctic wide area and extent have stalled over the last few days. Looks like a two year trend… does that even make sense? ** Merry Christmas to all and I hope we (me included) have a well feasted upon new year! You can hardly see it, so I marked it myself but 2018 is off to a really bad start. Still struggling, a week later. Regarding this graph of GIOMAS from wipneus…. …can’t charges be seemingly levelled at this for what looks like a cherry picked high beginning? Just saying…. maybe it would look markedly different if we were to forget the first year or two for instance?!!? 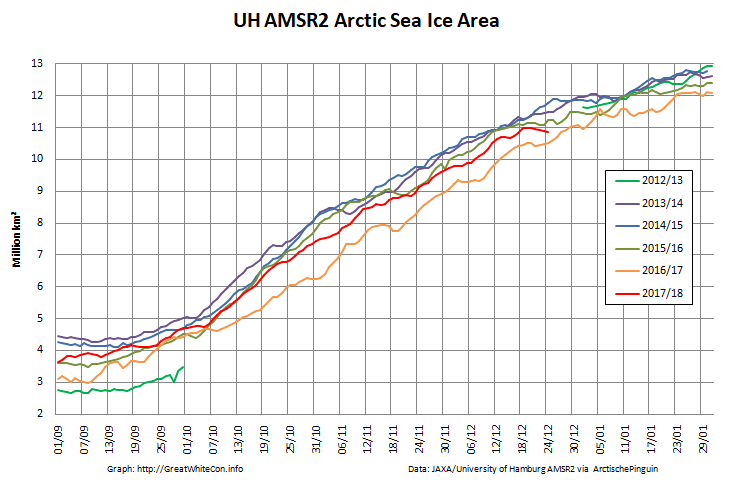 The graph starts when the satellites first flew and finishes in December 2016. Obviously not updated for a while! Don’t start repeating the denialista’s “cherry picking” nonsense please! Why arbitrarily ignore the first few data points?